DeckSafe Solutions recently provided GRP Solutions to help provide access for the Rail Industry. We were approached by our client who were looking for a safety solution to allow them access to the lighting and signal controls for the Railway Track. DeckSafe solutions designed, supplied and installed two bespoke designed GRP Access Platforms, designed for the maintenance teams. Our team of designers created two bespoke Access Units from our GRP - glass reinforced plastic. These units featured anti-slip stair treads and landings and safety hand-rails. 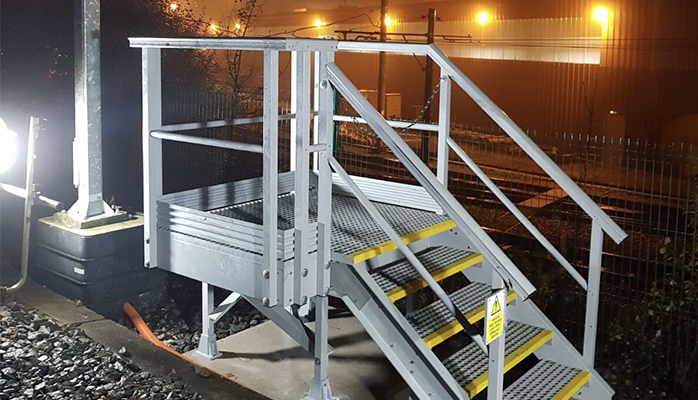 Our installation team installed the GRP Access Units quickly and efficiently during two allotted night-shifts - meaning minimal interruption for the day-to-day running of the railway. We received great feedback from the client, who are really pleased with the end result. Could your business benefit from a GRP Access Solution? Whether it’s a simple ramp to allow easy accessibility into your building, access to a rooftop or safety features to existing staircases, we can help. Contact our team today to find out more.